Click on this image to buy our book! Click on this image to get your FREE DistroTweak! Click on this link to learn more about our other courses! Welcome to Learn Linux and Libre Office! Welcome to our comprehensive step by step guide on how to install and use free open source tools (software) such as Linux and LibreOffice. Open source means the software is free and can be shared by anyone with anyone for any purpose. Open source is like a public library...free and open knowledge shared with the community for the common good. Free as in Freedom. No patents, no monthly fees, no hassles, no barriers, no limits! In the first chapter, we review the long list of problems associated with MS Windows. The second chapter outlines the benefits of Linux Mint and how switching to Linux addresses the problems created by Windows. 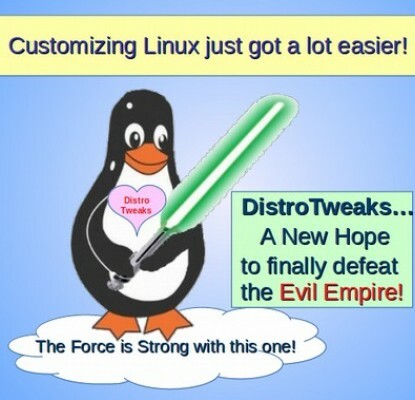 We also introduce a tool called DistroTweaks that makes switching to Linux much easier than it has been in the past. The third and fourth chapters explain how to transform a revolutionary new laptop called the Acer C910 into a fully functioning Linux computer. The fifth chapter describes how to use Libre Writer to create and edit documents – including MS Word documents. The sixth chapter explains how to use LibreOffice to replace everything you can currently do with MS Office – including creating charts and making presentations. The final three chapters review important topics such as managing your Linux computer, security tips and even how to run Windows programs in Linux. Linux runs 90% of all super computers – because it is very fast. Linux runs 80% of the world’s stock markets – because it is very safe. Linux runs 70% of all smart phones - because it is easy to learn. Linux runs 60% of the world’s Internet servers - because it is very dependable. Linux runs 50% of all tablets - because it is the most versatile operating system. Linux is so versatile that it can run almost any Microsoft Windows program – including MS Office. Most important, Linux does not allow the NSA – or anyone else - to gain access to the data on your computer. In short, Linux is the foundation for our global economy and the largest shared technology in history. Linux is also a free open source alternative to Windows 10! 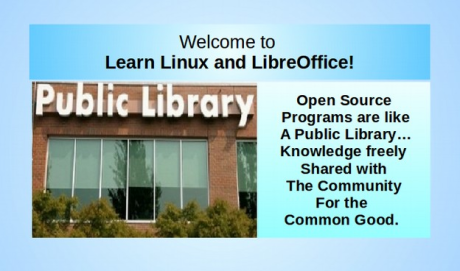 Why Learn Linux and LibreOffice? The reason to learn Linux and Libre Office is not merely to create better documents for books and websites. It is to learn about the advantages of using free open source community centered tools instead of monopolistic greed based tools. The reason Linux and LibreOffice are both free – and work so well - is because both Linux LibreOffice are developed by a “community.” The goal isn't to create a profit or monopolize a market. 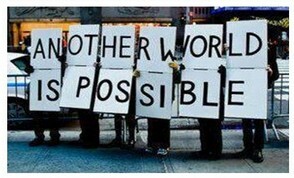 The goal is to create a better world, to create a better way to share knowledge. A free community centered world is difficult for people to imagine when they have grown up in a world that constantly tells them that “greed is good.” But where has this greed centered world gotten us? Unchecked greed has led to a world in which billionaires buy our elections and destroy our democracy. Billionaires control the media - prevented people from learning the truth about the world around them. The concentration of wealth and power has led to a world where millions of young adults are more than one trillion dollars in debt – to the point where they cannot even think about buying a home or settling down and having a family. Too many young adults are either working minimum wage part-time jobs or not working at all – and the middle class is rapidly disappearing. Nothing will be done to improve our economy or our democracy until we end the power of billionaires to control us. The most important reason to move away from Microsoft and Apple is because these programs are the tools billionaires use to enslave the rest of us. Controlling and limiting the way we share knowledge is the source of billions and even trillions of dollars of their profit. Every dollar we pay for a Windows based or Apple based computer or program is another dollar taken away from the people and put into the hands of the billionaires who buy our elections and control our media. Only by moving to Linux and other free open source community based tools can we break those chains and gain true intellectual freedom. If you have had enough of Windows 8 and Windows 10 viruses, the Blue Screen of Death and Microsoft’s never ending stream of model changes and price increases, we will show you how to switch to a free and more reliable alternative for your home, school and work computers – and then provide you with specific instructions on how to use these powerful open source tools. In 2012, after learning that Microsoft was going to pull the rug out from under hundreds of millions of Windows XP users by forcing them to upgrade to Windows 8 (now renamed as Windows 10), we began to search for better options. One option would be to spend $1,000 or more on an Apple computer. The problem here is that many people cannot afford to spend an extra thousand dollars. That is why they were still using Windows XP instead of Windows 7. In addition, Apple is a monopoly just like Microsoft. We realized that free open source programs are our only real option. We were aware that the best-selling laptops at Amazon.com were Google Chromebooks, that used the Linux operating system (which Google calls Chrome OS). These Chromebooks are inexpensive, lightweight and feature reliable and fast Solid State Drives – with additional capacity provided by USB flash drives. When asked why Google chose to use the Linux operating system on their internal computers and on their Chrome OS, the Google Technical Projects Director Thomas Bushnell said it was about security. He said that Google was a target for hackers and that the Linux operating system was the safest operating system in existence. He also said correctly that the only secure operating system was Linux. Even though our search brought us to Chromebooks, we were concerned that Chromebooks are pretty limiting in terms of the programs you can run on them. Google Chrome is limited to using Google Docs. What we were looking for was a solution which would work on any computer and run any program. Since the Google Chrome operating system is based on the Linux Ubuntu operating system, we tried four versions of Ubuntu. But they all had serious problems with their filing system and appearance. The filing system is more difficult to use than the Windows filing system. We really wanted something that was as close as possible to Windows so that our students would not have to face a steep learning curve. Finally, we tried a free open source program called Linux Mint. The Start Menu and filing system not only worked almost exactly like Windows XP and Windows 7, in many ways it was better! Linux Mint comes with a free open source word processor called LibreOffice. LibreOffice is better than Microsoft Office and can work with all of your Word and Excel and Power Point documents. It even works with PDF and HTML documents. Best of all, LibreOffice comes with several tools that help us create Ebooks and websites that match the appearance of our Print Books. Libre Office comes pre-installed on Linux Mint – along with dozens of other free open source programs! There are about two billion Internet capable personal computers in the world today. About 300 million new personal computers have been sold each of the past two years. Our goal is to convince as many of these 300 million people each year as possible to move away from an expensive and unreliable Windows computer to an inexpensive Chromebook and then install Linux Mint. Learn Linux and LibreOffice is the first of 8 courses we offer at College in the Clouds. The focus of all of these courses is how to use free Open Source solutions to share knowledge. We view this first course, Learn Linux and LibreOffice as the foundation for all of our other courses. Our second course, Create and Publish Your Own Book, assumes that you have already read and followed the steps outlined in this first course. This is because Linux and LibreOffice are the ideal tools for creating your own book. Our third course, Create Your Own Interactive Website, also assumes you have completed the steps in this first book – because Linux and LibreOffice are also the ideal tools for preparing and transferring content to our website. In the past, folks would use a Windows computer and MS Word to prepare images and text for their website. Sadly, when you try to transfer these Word documents and images to a website, the Microsoft coding is now so bloated, it can actually crash your website. The images often have huge file sizes and will not load properly. Even worse, MS Windows is so insecure that hackers can use “backdoors” in Windows to take over and take down your website. Thankfully, there is another better option that is actually free. Linux does not have backdoors like Windows and thus your website is protected. Using Libre Office, instead of MS Office means that your text transfers to your website seamlessly because Libre Writer documents lack the complex coding of MS documents. LibreOffice also has a free image optimization program to help you reduce the file size of images before importing them to your website. While you can get Libre Office for Windows, the biggest problem is the lack of security with using Windows when online. The only solution to this problem is to switch to Linux before you build your website. The best way to learn how to use open source tools is NOT by merely reading this book – but rather by following the instructions and using the screen shots to add open source tools to your computer as you read each chapter in this book! In other words, first read the chapter, then go back and follow the directions before proceeding to the next chapter. So, if you want to create your own book or create a secure interactive website or if you just want to have a faster and more secure computer, the time to learn Linux and Libre Office is now. Are you ready to learn the power and freedom of Linux and Libre Office? Let’s get started! David Spring, M.Ed. & Elizabeth Hanson, M. Ed.